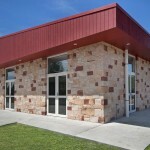 Random sandstone wall blocks from the Grampians Sandstone Quarry feature heavily on the new Dunkeld Community Centre. Designed by exciting young local architect Jakob Kelly, the community centre is a dream finally realised, replacing the old ‘Memorial Hall’ and providing a 200 person capacity function area, community kitchen, meeting rooms and modern amenities. 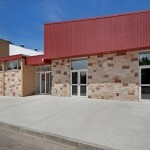 The cost of the project was funded by Southern Grampians Shire Council, the Victorian Government and $500,000 raised from years of local fundraising, with a significant contribution from the Myers family. 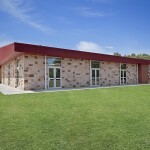 Built by Searle Brothers, Community Centre’s sandstone blocks and walling stone were supplied at cost price by the Grampians Sandstone Quarry and laid by local stonemason Alan Waters.